The CardioCare 2000 is an economically priced 12 channel resting ECG that does not compromise on performance. Suitable for use in private practice, ER, or hospital use, the CardioCare 2000 is designed for maximum ease of use and convenience. Software upgradeable and networkable, the CardioCare 2000 is an excellent choice for your diagnostic needs. Unit comes with 4-year warranty. the patient chart. A convenient Copy button lets you generate ECG copies in any of the available formats. 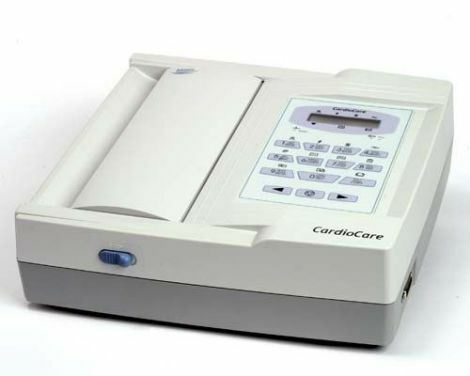 The CardioCare 2000 uses normal fax paper which costs about Â¼ the cost of ECG paper. It will even generate it's own grid! Direct faxing from the CardioCare 2000 offers much clearer ECG reports at the receiving end. Using an external modem connected to the CardioCare 2000, the user can easily transmit the ECG report to a remote location. EkgPlus displays real-time ECG data on-screen, instantly performs a full set of measurements and offers diagnostic aid. In addition, EkgPlus can eliminate the need for costly thermal paper by printing a variety of comprehensive reports on standard printer/copier paper. Now comes with free EKG Plus II software. This allows you to preview and control your Bionet EKG machine from your windows-based computer. * Save EKG's in JPG format that you can then file or e-mail. * Print your EKGs from your windows-based printer. * Magnify sections of the EKG tracing for easy reading. * Measure EKG complexes with easy to use tools. * Save and recall EKGs on your computer. * Change EKG settings (sensitivity, filters, output) on the fly in real time. * JPG format ensures compatibility with most EMR packages. * Transfer EKGs from the machine to your computer from the machine control panel or control everything from the computer. * Add custom comments to the EKG. * Includes both a monitor and record mode. * View a real time preview before you print. * Compare two different EKGs side by side.